I will teach you to be a better artist. That's the promise I made to students years ago when I launched Art Camp in 2013. Since then thousands of artists have taken these courses and become better artists. I'm thrilled to offer over 100 hours of fully narrated videos on how to make better work. These courses are the sum total of my knowledge on how to train artists. I'm so confident in all of the material that I absolutely guarantee that you'll enjoy it and learn to make better art. Everything is covered by a 100%, no-questions-asked money-back guarantee. That means you kinda can't go wrong by giving it a shot. So what exactly is Art Camp? Art Camp is a collection of 12-week self-directed online courses designed to give you the most progress for the time you put into it. While watching endless tutorial videos is great, Art Camp is all about giving you a structure to your education. These are the exact exercises you can use to improve your skills as an artist, no matter where you're at right now. Whether you're a beginner or a pro, these courses will push you to the next level. If you do these exercises, you will improve. I promise. $250 | Perfect for beginners! The best exercises and thought processes to grow into a better artist. Learn how to steal their secrets and do focused master studies. Learn to train your eye with basic drawing and observation techniques. These are the basics that everything else is built on. The ultimate primer on landscapes. Avoid the most common mistakes and learn the basic knowledge that will easily set your landscapes apart. Get an insight to how brains work and how it will help you stay focused, get over art blocks and tackle difficult learning goals. The road to improving starts with yourself! Too many people lose sight of how to apply the knowledge they learn. That's why we're starting with imaginative painting so early. Education without application is useless. Sketchbooks are the birthplaces of paintings. Learn to develop the habit of continual sketching and observation. In Art Camp tradition, we're going to be looking back at the old masters. This time we'll be looking at and studying their work through the lens of landscapes, and digging into the specifics of why they were great. An in depth approach to the art of making thumbnails and how to come up with ideas for them. One of the best ways to practice technique and learn to render objects. They have the advantage of never moving and giving you unlimited time to refine and study. That thing everyone hates. I'm going to break down perspective to the basics of what you need to learn and explain it as clearly as possible. Don't be afraid. It's not that scary. The building blocks of most landscapes. Study their forms and learn them like you never have before. Think of this like the anatomy of landscapes. One of the most important weapons in your arsenal! Get ready for some serious theory on this one. Learning to paint a face requires painting a lot of faces. One of the easiest ways to do this is self-portraits, as you never have to worry about finding a willing model. Learn to play around with new materials in drawing. We'll cover charcoal, graphite, pastel, ink, and perhaps others in an attempt to see what these mediums can offer us. If last week was studying the midground, this week we're tackling the background. We'll continue to strive to understand form so we can avoid flat, boring landscapes. Most people struggle with this one so I'll show you that its actually not that bad. Breaking it down to the basic shapes and moving on from there. Getting outside to work is a wonderful way to study both people as well as the natural world. Let's get into the habit of leaving our studios. Most people paint digitally because they think traditional painting is expensive and/or complicated. But I'll show you how to do it. I promise you'll love it. See and understand the essential lighting schemes in landscapes and learn how to replicate them. How to go from thumbnail to final is often a tricky process so we will take it step by step and talk about why it's important to do this properly. Photos are easily available but can cause extremely harmful habits if used incorrectly. I'll show you how to learn from photo reference without harming your skills. I'm going to show you every trick, tool, and method I know for working digitally. Specifically designed for working in Photoshop. Beginning with observational thumbnails before shifting into more imaginative work, we'll closely analyze the unique compositional challenges and advantages in landscape painting. I know you were wondering when this would come into play. I will show you the benefits of it and the downsides. Buzzwords: Rapid iteration, kill your darlings. There are many different types of materials in the world—things like cloth, silk, metal, rock, flesh, etc.—and all of them require slightly different treatments. We'll learn how light affects them differently and how to use edges to convey texture. Learning to draw & paint basic forms is a cornerstone of learning any new medium. These fundamental exercises will push our facility to the next level. Lighting is one of the best ways to make a landscape interesting. Learn to create amazing, interesting, unique lighting in your work. What happens between the color sketch and final noodling stages and how do you get that 'delicious' concept feel in your images. The human form is one of the most beautiful and challenging subjects that we can paint. This week we'll go over useful exercises, approaches, and resources for drawing & painting figures. Learn to communicate compelling narrative in visual and written form. Let's dive into the art of storytelling. From a sweeping tundra to a lush rainforest, and from a barren desert to a snow capped mountain, we'll look at the best ways to capture these unique vistas. In the concept world an image is never done. Even after its done. I'll show you the finalization of an image and what can happen to it after you give it to the team. We'll go over the basics of developing original concepts in our work. Even if you want to pursue another field, the ability to come up with unique concepts and ideas is critical in art. Storyboards, comics, and other sequential art. Learn the freedoms and challenges that come with working with multiple images. I mistakenly thought (for years) that landscapes couldn't possibly have emotion—and how wrong I was! This week we'll see how we can create a story or a feeling with "just" a landscape. Prop density, detail aspect ratio, AI movement, camera restrictions and much more in depth game design restrictions. The more you know! This week we will learn how to create striking, dynamic compositions as we begin to develop a finished portfolio piece to wrap up the course. Get out your cameras. I'm going to show you how to use photography to improve your other artistic skills. Also we'll be talking about shooting good reference and using it effectively. An extended demo of a fully finished landscape piece, showing off a painterly approach and finish. For this and the remaining weeks, all work will be shown. From first marks to the last, you'll see exactly how it's done. Making mistakes costs time so let's review properly how to avoid this. Bonus round: Dealing with stress and prioritizing. Using the portfolio piece we are creating as a base, we will explore the world of color & light and learn how to use them to convey emotion. Learn to think entirely differently. Working in three dimensions will radically change how you approach your drawings. Trust me—you don't want to miss this. Another finished painting, this time utilizing photos both as reference as well as placed directly into the piece to speed up production time. Yes, there is a difference, stick around if you want to know more. Many of us struggle with finishing work. We can start a piece, but have no idea how to finish our work. This week I'll go over the techniques and approach I take in finishing my work. How to find your "style" and do work that you love. See how to use 3d tools to make better work, faster. See how to make these tools work for you, and not the other way around. It's time I summarize everything and make sure you are all good to go. I will also show finalization of the interior image. “Art camp has helped me by providing me with new tools and methods for improvement, a new perspective to view art, and by bolstering my foundational understanding and skills in art. Art camp is awesome in that Noah divides the weeks up into practice methodologies. Instead of just teaching one-and-done lessons, he teaches you a method that you can use to guide your improvement. He discusses master studies, self portraits, and how to conceptualize materials. You learn from the lesson, but you also learn how to improve your art by honing your observational abilities. If you are struggling in an area, Noah shows you a handle to pull yourself up to the level you desire to be at. I found Noah's perspective on art to be open and helpful as well. He broadened my idea of art, which helped me understand what makes a master's work exceptional. “Art Camp kind of kickstarted my artistic career. Every week you'll login to the site here and watch a 2 hour demo video showing how to do the assignment, what you should be thinking about, and how to get the most out of the assignments. Then you'll start to dive into that week's assignments, whatever they might be. If you get stuck, want to take a break, or have something to share, you can hop in the brand new group chat with all of the other Art Camp students. “When I decided to train to become a professional artist, I couldn't afford art school, so I looked for other options. The internet has a lot of resources, but I was overwhelmed with the task of deciding what would be the right thing to study. Then I found Art Camp and the information and guidance provided there erased almost all of the confusion. “I joined Art Camp a few years ago when I decided I want to improve my skills and learn how to draw. It was my first stepping stone as a digital artist and it has helped me immensely. The program follows a structured methodical approach, teaching one topic each week with given homework that acts as a guide to improve. I didn't feel I was drawing for the sake of drawing but instead working on improving my skills. 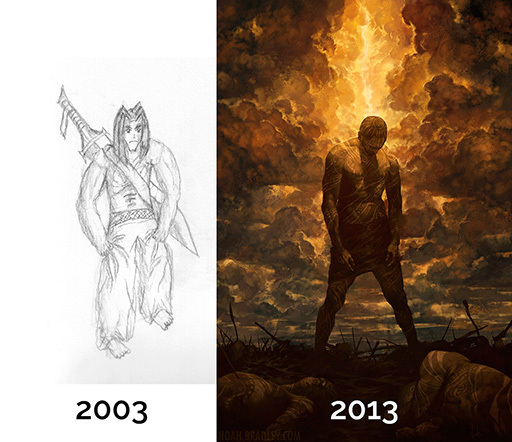 It taught me how to be patient, and seeing other fellow artists studying hard and pushing their boundaries was a motivation to keep on going no matter what. The Art Camp community were all very supportive and friendly, many of which I keep in contact with still. One of the most important takeaways was that I learned how to study. The fact that you are given a lifetime access to the program enables you to study at your own pace and redo the course any time you want in the future. No, really, for any reason. I promise. I am extremely confident in the quality of these courses and never want someone's money unless they loved the experience and thought it was worth every dime. I have been blessed to witness a thriving community blossom around Art Camp. And now, thanks to a brand new group chat application, we're going to interact like never before. There's a structure to the course, but it's designed to be flexible. Everyone's in a different situation, so there are tiered assignments for every kind of student. Each course ends up with over 24 hours of demo material. And that's not including any bonuses, critique videos, or Q&A sessions. It'll keep you busy. I promise. Did I mention you can also download everything DRM-free? We've set up the Art Camp community on a new Discord-powered private channel. No matter what time zone you're in, you'll find peers to share your work and talk shop with. Get and give critique easily and instantly. You can even leave the voice-chat on in the background while you do your studies for a bit of camaraderie. Nearly every artist struggles with confusion about what they should work on. Art Camp removes that confusion. You know precisely what you should work on to improve your skills. You should be wherever you're at! Art Camp 1 & 2 are perfect for complete beginners or seasoned professionals. No matter how new or experienced someone is, these fundamental exercises are vital to improving. Art Camp 3 & Titus's ECD course are geared at more intermediate students. It helps to have a decent grasp of painting before starting these. Unfortunately not. To make Art Camp accessible to more students, I have to keep the price low. And when the price is low... suddenly there are tons of students! So if the course is going to stay accessible, it's going to be impossible for me to give individual critiques to everyone. That said, there is an amazing group of fellow students just like you eager to give/get critiques. So let's all learn together. That said, I am doing live critiques for anyone who signs up for Art Camp 3: Landscapes by July 4th! Pretty much anything! Art Camp 1 are fundamental exercises that can be done in any medium. Art Camp 2 is similar but there are a few weeks with more specific media experiments. Art Camp 3 & ECD are focused on primarily digital work (with Photoshop), so to get the most out of those courses, we recommend having access to a computer & tablet. You can register anytime you want! The courses can be taken at your own pace, on your own schedule, whenever you want. Art Camp 3: Landscapes is being run live this summer, with new critiques every week starting July 4th! As much as you want it to. The more time you spend on it, the more you're going to get out of the course. I generally suggest having at least two hours a week to watch the demo video as well as four hours of additional time to do the assigned work. On the other end of the spectrum, there's enough assigned work in some weeks that you could easily fill 40 hours. Oh no! Well then you can always email help@artcamp.com with whatever question you have and I'll do my best to get back to you as quickly as I can! I am a strong believer that if you pay for something, you should own it. I hate paying for something, and then losing access to it later on. Pay once and these videos are yours. You can stream them or download them anytime you want, forever. When in doubt, Art Camp 1 is always good. It's the best for fundamental exercises. Art Camp 2 is good if you want a similar experience, but with a bit more experimentation and boundary-pushing. Titus's ECD is incredible for concept artists (especially those with an environment focus). Art Camp 3 is perfect if you struggle with painting "backgrounds" or if you want to take your landscape skills to the next level. Are you ready to become a better artist? Art Camp is here with the framework, community, and resources to get you there. No matter where you're at right now or where you're going, these courses will make the journey clearer. Already have an Art Camp account? Login now.